It would be a waste of a donut if you were to stick pins into it, not to mention dangerous to everyone else since one might actually swallow the donut with all the pins inside, even more so if the pins were specially colored to look like some sort of rice candy. 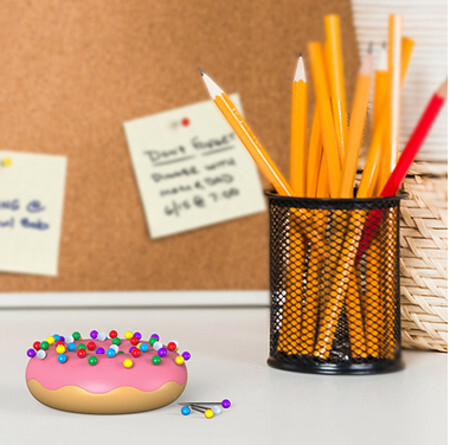 Well, here’s something that is a whole lot more sae – the $8.99 Desk Donut Eraser and Pin Holder. It comes “sprinkled” with 50 colorful pins for your corkboard, and is made of PVC- free non-toxic TPR, arriving in a full-color gift box.